In the 1920s Reverend W. Harvey Wages served as pastor of the Ray City Baptist Church. He was tall and slender with blue eyes, an enthusiastic and talented young minister. Reverend Wages would go on to become a leading pastor of Georgia churches, a member of the State Baptist Executive Committee of the Georgia Baptist Convention, and chaplain of the Georgia House of Representatives. W. Harvey Wages was born June 30, 1889 in Cedartown, Polk County, GA. Some time before 1907, the Wages came from Polk to Thomas County. On December 22, 1907, W. Harvey Wages married Eugenia Wilson in Thomas County. She was born December 24, 1891. By 1915 W. Harvey Wages had taken up the Baptist ministry in Thomas County, and in 1920 he was serving as pastor of the Baptist church in Pavo, GA. About 1921, Reverend Wages moved his family to Ray City, GA where he took over as pastor of the Ray City Baptist Church. Within a few months, he was also serving as pastor of the Milltown Baptist Church. In October, 1922, Reverend Wages gave up the Ray City Baptist Church. Milltown, Ga., October 26.-(Special.) – Rev. W. Harvey Wages, who resigned the pastorate of the Ray City Baptist church recently moved his family here this week that he may be able more carefully to look after the Milltown church. Mr. Wages has been living in Ray City about a year, during which time he was pastor of the Baptist church there. He has been pastor of the Baptist church in Milltown for several months. By 1923, Reverend Wages was also serving as pastor of the Stockton Baptist Church. He continued to be quite active in many revivals throughout this section, as well as weddings, funerals, and other ceremonies. In 1923, Rev. Wages conducted a revival at Good Hope Baptist Church – Perry Thomas Knight had served as pastor of this church in 1909. Rev. W. Harvey Wages, pastor of the local Baptist church, is conducting a revival meeting at Good Hope church in the southern part of Lanier county, near Naylor. Rev. Roy Powell, of Nashville, Ga., is the pastor of this church. The meeting began last Saturday and will go on through this week. Milltown, Ga., September 29. – Mrs. Lula Sutton has announced the marriage of her daughter, Berta Sutton to Charles Ennis Vizant, of Jacksonville, Fla., which occurred some days ago at the home of her cousin, O. M. Cameron, the ceremony being performed by Rev. E.D. McDaniel of Avondale Baptist church, Jacksonville. Mr. and Mrs. Vizant are at home to their friend at 1546 Roselle street, Jacksonville, Fla. The many friends of Miss Mary Knight, who is well known in this state will be interested in the announcement by her father and mother, Rev. and Mrs. L. J. Knight, of Milltown, Ga., that Rev. Dr. A. R. Faralane, of Kansas City, Mo. and Miss Mary Knight, of Milltown, Ga., late of Independence, Mo. were married at Independence, Mo., Friday, September 7. Mr. and Mrs. Wm. Pierce, of East Lanier, announce the marriage of their daughter, Miss Bell Pierce to George Hires, of near Waycross, the ceremony being performed by Rev. W. Harvey Wages, of Milltown. They are living near Waycross. Miss Audrey Nicholson, the attractive young daughter of Mr. John Nicholson, of Ousley, Ga., was married Sunday afternoon to Will Williams, of near Morven. The ceremony was performed by Rev. A. L. Colson, near Valdosta, being witnessed bu a few intimate friends. The young couple will make their home near Morven, in Brooks county. 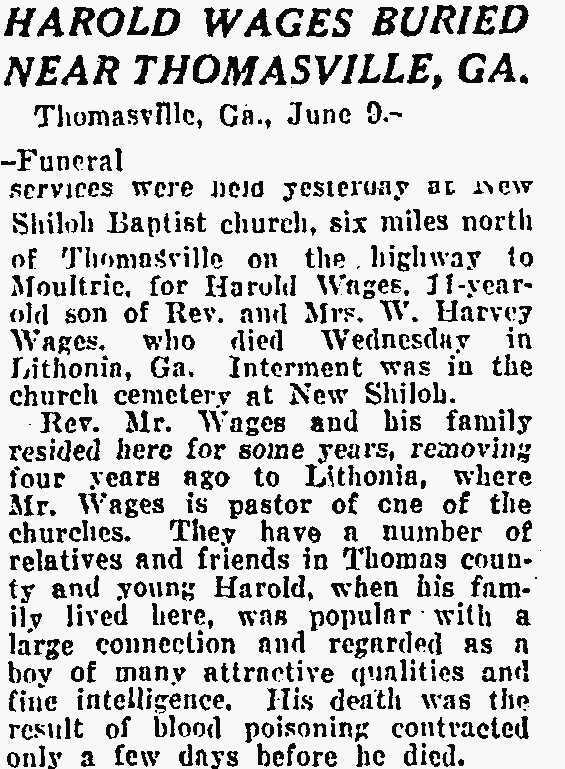 Harold Wages Buried Near Thomasville, GA.
Thomasville, Ga., June 9. – Funeral services were held yesterday at New Shiloh Baptist Church, six miles north of Thomasville on the highway to Moultrie, for Harold Wages, 11-year-old son of Rev. and Mrs. W. Harvey Wages, who died Wednesday in Lithonia, Ga. Interment was in the church cemetery at New Shiloh. Rev. Mr. Wages and his family resided here for some years, removing four years ago to Lithonia, where Mr. Wages is pastor of one of the churches. They have a number of relatives and friends in Thomas county and young Harold, when his family lived here, was popular with a large connection and regarded as a boy of many attractive qualities and fine intelligence. His death was the result of blood poisoning contracted only a few days before he died. 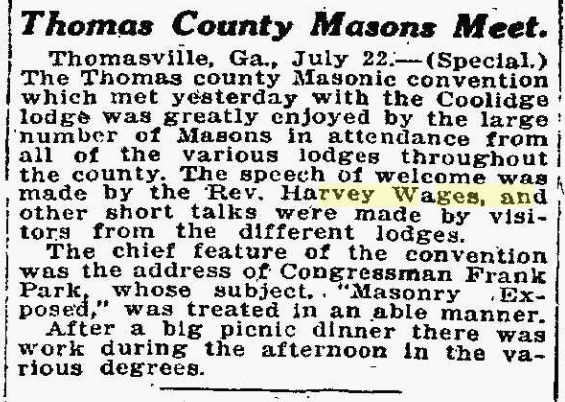 Reverend W. Harvey Wages was active with the Masons, July 23, 1915. Thomasville, Ga., July 22. – (Special.) The Thomas county Masonic convention which met yesterday with the Coolidge lodge was greatly enjoyed by the large number of Masons in attendance from all of the various lodges throughout the county. The speech of welcome was made by the Rev. Harvey Wages, and other short talks were made by visitors from the different lodges. The chief feature of the convention was the address of Congressman Frank Park, whose subject, “Masonry, Exposed,” was treated in an able manner. After a big picnic dinner there was work during the afternoon in the various degrees. Congressman Frank Park owned a large plantation in Worth County, and had been responsible for organizing the great Possum Banquet, with ‘taters and persimmon beer for President Taft in Atlanta in 1909. Reverend W. Harvey Wages later served as pastor of Lynn Haven Baptist Church, Panama City, FL. He died September 27, 1971. He was buried at the Wilson Family Cemetery, Thomas County, Georgia, USA. Eugenia Wilson Wages died June 5, 1977 and was buried next to her husband.